Rep. Paul Broun (R) of Georgia is among the many Americans who aren’t at all sure of exactly what agenda President-Elect Barack Obama has planned for our country. In an Associated Press interview, Paul Broun’s ‘Obama dictatorship’ comments came about when he compared Obama’s proposal of a civilian national security force to that of the infamous Gestapo of Germany in World War II. The basis of Rep. Broun’s concerns stems from a speech in July, when then candidate Obama stated, “We cannot continue to rely on our military in order to achieve the national security objectives we’ve set. We’ve got to have a civilian national security force that’s just as powerful, just as strong, just as well-funded.” [emphasis added] Rep. Paul Broun fears an eventual Obama dictatorship under which civil liberties, such as the right to bear arms, will be taken away from the People based upon his campaign platform. Nov. 12: Over 1 million fake editions of the New York Times were printed and handed out to New York commuters with the headline ‘Iraq War Ends’. Contessa Brewer reports. Keith Olbermann was the only major U.S. media source to cover this huge story. 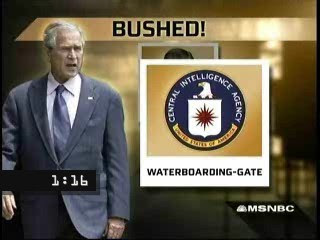 The scandals never stop for the Bush administration, do they? For Thursday’s edition of Bushed! we have the news that former Attorney General John Ashcroft received a windfall $29-52M no-bid contract from US Attorney Christopher Christie to monitor an out of court settlement with a medical supply company.